OCZ has just unveiled the latest DDR3 memory module targeted for AMD platforms. Being extended from its existing DDR3 module product lines, the newly announced memory module is claimed to be redesigned and has been certified to be fully compatibility when running with AMD Phenom II processors. OCZ DDR3 module is available in dual channel mode clocking at 1600MHz and it is not only designed with ultra low voltage (at 1.65V) targeted for highly thermally efficient platform but it has been enhanced with AOD (AMD OverDrive) feature so that users can instantly enjoy the best performance with just plug and play capability. The mechanism behind is the compatible platform with Phenom II processor will able to recognize the OCZ Black Edition memory RAM when plugged into the slot and those data will be sent to AMD server to retrieve the correct profile/configuration so that your system can utilize the best of it without the need of manually overclocking and configuring for best system stability with most optimized PC system performance suitable for high end gaming as well as graphics intensive applications. 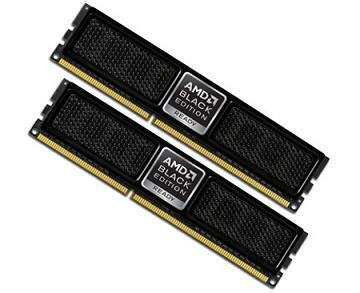 No exact pricing and availability yet, OCZ Black Edition DDR3 memory modules will be available in DDR3 PC3-12800 at 4GB capacity with AMD’s XTC (Extreme Thermal Convection) heatspreader and lifetime warranty targeted AMD flavored enthusiasts.